This EEA report outlines the progress renewable energy sources (RES) made in 2015 in the European Union (EU) as a whole, and at country, market sector and technology level. It also provides early European Environment Agency (EEA) estimates regarding developments at all of these levels in 2016. The report confirms that the EU remains on track to reach its 20 % RES share target for 2020, despite RES growth across the EU having recently slowed. It also highlights that the additional consumption of RES across Europe since 2005 has had a number of co-benefits thereby allowing the EU to cut its demand for fossil fuels and their associated greenhouse gas (GHG) emissions by about one tenth, compared with a situation in which renewables remained at 2005 levels. It also helped the EU and its Member States reduce primary energy consumption. The report also shows that EU is progressing slightly better overall, in terms of RES deployment, than other parts of the world. Today, the EU is a global leader in terms of renewable power capacity per capita; between 2005 and 2015, the speed at which the EU has transformed the energy resource base supporting its economic activity has outpaced that of other world regions. Moreover, European developments have significantly contributed to the initial development and roll-out of renewable energy technologies. 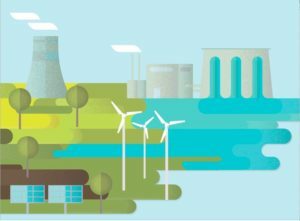 Within these selected perspectives, this report complements the EEA’s recent assessment in its report, Trends and Projections in Europe 2017 — Tracking progress towards Europe’s climate and energy targets (EEA, 2017a). Today, RES are a major contributor to the energy transition in Europe. The speed at which renewables have grown since 2005 took many market actors by surprise, especially within the power sector. In fact, the rapid development of some renewable energy technologies and consequent cost reductions have already led to RES technologies achieving high market shares. Today, for solar photovoltaic electricity, as well as biogas electricity and solid biomass use for heating and cooling, these shares are at, or close to the levels anticipated to be reached by 2020 in the National Renewable Energy Action Plans drafted by countries in 2010. In 2016, renewable energy accounted for the overwhelming majority (86 %) of new EU electricity-generating capacity for the ninth consecutive year. Moreover, the EU continues to decommission more capacity from conventional sources than it installs. This has led to GHG emission reductions in the EU electricity sector, in the consumption of energy for heating and cooling, and in transport. The EU is currently on track to meet its renewable energy target for 2020. The EU-wide share of renewable energy in final EU energy use increased from 16.1 % in 2014 to 16.7 % in 2015 and to an expected 16.9 % in 2016, according to the EEA’s early estimates. This gradual increase has occurred despite an uptick in energy consumption from all sources, observed over the past two years across the EU (EEA, 2017a). Steady RES progress indicates the EU has met its indicative trajectory for 2015-2016, as set out in the Renewable Energy Directive (RED), and the expected trajectory path for both years resulting from the National Renewable Energy Action Plans (NREAPs) adopted by countries. However, the average yearly growth of the RES share slowed down in 2015 (to 6.4 %) and 2016 (to 5.9 %) compared with the average annual pace of growth recorded between 2005 and 2014 (6.7 %). Today, the RES shares continue to vary widely between countries, ranging from over 30 % of gross final energy consumption in countries such as Austria, Denmark, Finland, Latvia and Sweden, to below 9 % in Belgium, Luxembourg, Malta, the Netherlands and the United Kingdom. In absolute terms, renewable heating and cooling remains the dominant RES market sector in Europe. At the EU level, RES made up close to one fifth of all final energy consumed for heating and cooling (18.6 % in both 2015 and 2016, according to reported data and early EEA estimates). The sector grew by 4 % each year, on average, over the period 2005-2015 — a growth rate that must be maintained in order to realise NREAP expectations for 2020. In 18 Member States, renewable heating and cooling represented over half of the national gross final consumption of renewables in 2015 (Bulgaria, Croatia, Cyprus, the Czech Republic, Denmark, Estonia, Finland, France, Greece, Hungary, Italy, Latvia, Lithuania, the Netherlands, Poland, Romania, Slovenia and Sweden). Since 2005, despite biogas and heat pumps having the fastest compound annual growth rates, solid biomass-based technologies prevailed in this market sector. In absolute terms, renewable electricity is the second largest RES market sector in the EU. It grew at the second highest rate of 7 % per year, on average, between 2005 and 2015. This was driven especially by growth in onshore and offshore wind power and solar photovoltaic (PV) electricity generation, but also by other RES, such as an increase in solid biomass combustion for electricity purposes. About 29 % of all electricity consumed in the EU in 2015, and an estimated 30 % in 2016, originated from renewable sources. Efforts to date will need to be maintained to realise the NREAP expectations for renewable electricity by 2020 (an annual 5 % growth rate is necessary). In only four countries, however, did the share of renewable electricity represent over half of all gross final consumption of renewables in 2015 (Ireland, Portugal, Spain and the United Kingdom). In the EU transport sector, renewable energy made up around 7 % of all energy use in both 2015 and 2016, according to reported data and the EEA’s early estimates. With renewable electricity currently playing only a small role in transport, the bulk of renewable energy use in this sector comes from biofuels. Transport biofuels grew fastest over the period 2005-2015 (at 16 % per year, on average), as they increased from a very low level in 2005. Nevertheless, comparable efforts are needed in this market sector in the run-up to 2020, requiring a compound annual growth rate of 17 % to reach the NREAP targets for 2020. A higher share of renewable electricity use in the transport sector would reduce the pressure on transport biofuels to reach the EU’s target of a 10 % RES share consumed in transport by 2020. The share of renewable energy in transport varied across countries, from a maximum of 43 % of all RES consumption (Luxembourg) to close to 0 % (Estonia and Spain). In 2017, most climate mitigation policies and measures reported by the Member States under EU reporting requirements (the Monitoring Mechanism Regulation (MMR)) were aimed at the energy consumption (29 %), transport (21 %) and energy supply (15 %) sectors. The objective of such policies and measures was often to increase the RES share (EEA 2018, forthcoming). Progress towards national and EU RES targets since 2005 has allowed renewables to effectively substitute fossil fuels and reduce GHG emissions across Europe. The additional consumption of renewable energy, compared with 2005 levels, allowed the EU to cut its demand for fossil fuels by 135 million tonnes of oil equivalent (Mtoe) in 2015 (see Figure ES.1). This is equivalent to one tenth of the EU’s gross inland consumption of fossil fuels and more than the fossil fuel consumption of Italy. Coal was the most substituted fuel across Europe (representing 44 % of all avoided fossil fuels), followed by natural gas (roughly 30 % of all avoided fossil fuels). The reduction in petroleum products and related fuels was less pronounced because of the lesser share of RES use in the transport sector. In 2016, the amount of substituted fossil fuels is estimated to have increased by 10 Mtoe (to 145 Mtoe). The growth in the consumption of renewable energy after 2005 helped the EU achieve an estimated gross reduction in CO2 emissions of 9 % in 2015, compared with a counterfactual scenario in which RES consumption stayed at 2005 level. In 2016, the effect on CO2 emissions increased further, resulting in a gross emission reduction of 483 MtCO2 (an 11 % gross reduction in the EU), which represents more than the annual GHG emissions of Italy. Most of these changes took place in energy-intensive industrial sectors under the EU Emissions Trading Scheme (ETS), as the increase in renewable electricity decreased the reliance on fossil fuels and made up roughly three quarters of the estimated total EU reductions. National RES deployment since 2005 led to the largest reduction in domestic fossil fuel use and avoided GHG emissions in Germany, Italy and the United Kingdom in both 2015 and 2016. In relative terms, however, the Nordic countries (Denmark, Finland and Sweden) remained the top three countries in the EU in 2015 in terms of their overall effectiveness in substituting fossil fuels and reducing GHGs by increasing their RES deployment. Whereas the Renewable Energy Directive (RED) sets binding targets for 2020 for the share of renewable energy in gross final energy consumption, the Energy Efficiency Directive puts forward targets expressed in primary energy. Understanding the interactions between different RES technologies and their impacts on primary energy use, from a statistical point of view, is useful to policy-makers. By 2015, the increase in the RES share since 2005 had resulted in a 2 % EU-wide reduction in primary energy consumption, according to accounting rules in use in European energy statistics. Some RES technologies have led to a relatively large statistical decrease in primary energy consumption (especially wind power and solar PV in the renewable electricity market sector). This is because these RES technologies are deemed to have a 100 % conversion efficiency, while generating electricity from fossil fuels requires greater amounts of primary energy. Other RES technologies have led to a statistical increase in primary energy consumption (especially solid biomass use for heating and cooling, but also geothermal energy), which may have dampened national efforts to reduce domestic primary energy consumption. Global investments in renewables have shown steady growth for more than a decade. This has led to a doubling of global renewable electricity capacity between 2005 and 2015. By 2016, for the second year in a row, more than half of all newly installed power capacity worldwide was of renewable origin, as RES accounted for an estimated 62 % of added net power generation capacity in that year (IRENA, 2017a; Frankfurt School-UNEP, 2017). In 2016, the EU still ranked second after China as regards total installed and grid-connected domestic renewable electricity capacity. Seen by technology and market sector, global RES development in 2016 was dominated by high investment in solar and wind energy for electricity generation. Together, these technologies accounted for over 90 % of total global RES investments (Frankfurt School-UNEP, 2017). At the other extreme, investments in biofuels (used mainly in transport) were lower in 2015 than in 2005, possibly because interest in first-generation biofuel capacity is plateauing and second-generation biofuel technologies still struggle with delays while they overcome technical and financial obstacles. With an average renewable electricity capacity of 0.83 kilowatt (kW) installed per person in 2016, the EU is the clear world leader on a per capita basis, ahead of the USA, Brazil and China. In addition, in 2016, Europe still had the largest solar PV and wind capacities in place globally. However, China has quadrupled its installed capacities since 2005 and is poised to overtake the EU as world leader in annual solar PV and wind power capacity additions in the near future, as the country strives to become a global leader in innovation, science and clean technology by 2050. Over the period 2005-2016, the renewable electricity capacity installed per gross domestic product (GDP) unit in the EU grew at an average annual pace of 7 %, which is faster than the pace of growth in other world regions. This suggests the EU has outpaced other world regions during this period in terms of transforming the energy resource base of its economic activities. Growth in renewable electricity capacity installed per unit GDP in the EU has been particularly notable since 2009 (see Figure 4.3). This coincides with the adoption in 2009 of the EU climate and energy package. 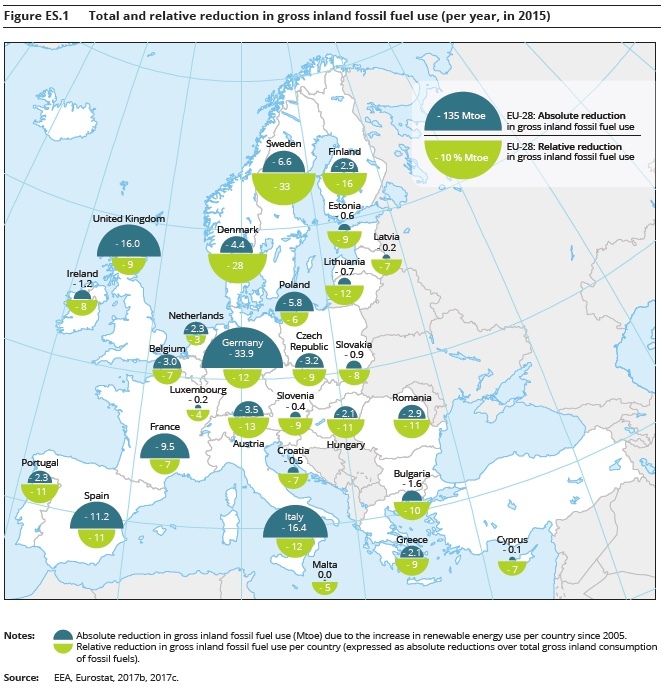 Between 2005 and 2012, Europe recorded the highest annual shares of global new investments in renewable power capacity. Despite declining from 46 % in 2005 to 35 % in 2012 (and 25 % in 2016), these high annual shares highlight Europe’s pioneering role in developing renewable energy globally. Since 2013, however, China claims the highest annual shares of global new investments in renewable power capacity, reflecting the fact that global investment activity is spreading to more attractive, non-European markets. The EU is also one of the key global players in terms of employment in the renewable energy sector. In 2016, it came fourth, after Brazil, Japan and the United States, in terms of the share of renewable energy jobs per capita in the labour force. Within the EU, Germany was the number one employer per capita in the labour force, second only to Brazil. The largest employers in the EU renewables sector are the wind, solar PV and solid biomass industries. Over the past five years, job losses were experienced in the solar PV industry and in the wind power sector, as competition from other producing markets, including in China, continued to grow. As the EU strives to become a sustainable, low-carbon economy by 2050, developing its global competitiveness in knowledge-intensive renewable energy is essential. Currently, Member States need to overcome a number of important challenges. In the short term, these range from formulating adequate policy responses that will meet national climate and energy targets, to agreeing on a functional EU system for the monitoring and adjusting of efforts, and for cooperation. In the medium term, Member States need to improve their national innovation capabilities as a way to increase benefits from the ongoing energy transition in Europe. In the context of 150 non-EU countries having set national RES targets intended to reduce GHG emissions — most of which have also adopted policies to catalyse national RES investments (IRENA, 2017b) — the EU and its Member States need to step up their efforts and remain leaders in low-carbon energy transitions. To maintain this momentum, the EU and its Member States should reinforce and build existing, home-grown expertise and innovation capacity in renewable energy and energy efficiency solutions. This will also help retain Europe’s global competitiveness in these knowledge-intensive, growing sectors. Together with the EU 2030 targets for energy and climate, the more systematic cooperation and coordination of national policies and measures between Member States — outlined by the European Commission in its legislative proposals of November 2016 — could represent a step in the right direction.